Kawasaki disease (KD) is an acute self-limiting inflammatory disorder, associated with vasculitis, affecting predominantly medium-sized arteries, particularly the coronary arteries. In developed countries KD is the commonest cause of acquired heart disease in childhood. The aetiology of KD remains unknown, and it is currently believed that one or more as yet unidentified infectious agents induce an intense inflammatory host response in genetically susceptible individuals. Genetic studies have identified several susceptibility genes for KD and its sequelae in different ethnic populations, including FCGR2A, CD40, ITPKC, FAM167A-BLK and CASP3, as well as genes influencing response to intravenous immunoglobulin (IVIG) and aneurysm formation such as FCGR3B, and transforming growth factor (TGF) β pathway genes. IVIG and aspirin are effective therapeutically, but recent clinical trials and meta-analyses have demonstrated that the addition of corticosteroids to IVIG is beneficial for the prevention of coronary artery aneurysms (CAA) in severe cases with highest risk of IVIG resistance. Outside of Japan, however, clinical scores to predict IVIG resistance perform suboptimally. Furthermore, the evidence base does not provide clear guidance on which corticosteroid regimen is most effective. Other therapies, including anti-TNFα, could also have a role for IVIG-resistant KD. Irrespective of these caveats, it is clear that therapy that reduces inflammation in acute KD, improves outcome. This paper summarises recent advances in the understanding of KD pathogenesis and therapeutics, and provides an approach for managing KD patients in the UK in the light of these advances. Kawasaki disease (KD) affects 8.1/100 000 children under the age of 5 years in the UK, and is the commonest cause of acquired heart disease in children in developed countries.1–3 KD probably represents an aberrant inflammatory host response to one or more as yet unidentified pathogen(s), occurring in genetically predisposed individuals.2 ,4 ,5 KD is associated with systemic vasculitis particularly affecting the coronary arteries, causing coronary artery aneurysms (CAA) in 15–25% of untreated patients while 2–3% of untreated cases die as a result of coronary vasculitis.6–9 In view of the frequency and severity of coronary artery complications, there has been intense interest in treatments to reduce the risk of CAA.6 ,10–14 KD is also potentially an important cause of long-term cardiac disease in adult life.6 ,7 Notably, as more children with KD are advancing into adulthood, further studies are needed to (1) improve our understanding of long-term cardiac sequelae, (2) optimise therapy in childhood to minimise risks in adulthood and to ensure the continuation of quality, evidence-based care for KD patients as they transit to adult services. The purpose of this article is to summarise recent advances in our understanding of the pathogenesis and treatment of KD, and to provide an approach to managing KD in the UK in the light of these advances. The updated guidelines are based on evidence from meta-analyses and randomised controlled trials (RCTs), and will highlight areas of practice where evidence remains weak. Last, suggestions for future research are outlined. Many candidate genes have previously been suggested, either as susceptibility genes for developing KD; or increasing risk of CAA.29–31 These are summarised elsewhere.31 Most of these earlier studies, however, failed to identify definitive genetic associations, emphasising the difficulties of the candidate gene approach for a disease where the pathogenesis is poorly understood.32 By contrast with the candidate gene approach, genome-wide association studies (GWAS) have the advantage of identifying disease-associated genes without requiring prior knowledge of the mechanisms involved.32 A number of GWAS of KD have been published so far.33–39 From these studies, several single nucleotide polymorphisms (SNPs) associated with susceptibility to KD, including ITPKC, ABCC4 and FCGR2A, CD40 and a gene region near FAM167A-BLK (table 1). Furthermore, other genes have been associated with non-response to intravenous immunoglobulin (IVIG) and risk of CAA, including CASP3, FCGR3B and genes of the TGF-β signalling pathway.40 ,41 It is likely that many other genetic factors have yet to be identified, as the GWAS methodology has so far only identified the most significant associations.32 Whole exome sequencing studies applied to individual KD cases of extreme phenotype, such as those with giant CAA, could clarify the contribution of rarer genetic variants in these extreme cases. Thus, the study of the genetic contribution to KD remains an intense area of research worldwide, and still very much a work in progress. There is no diagnostic test for KD, thus the diagnosis rests on combinations of clinical criteria and laboratory findings (table 2). For the diagnosis to be established according to the Diagnostic Guidelines of the Japan KD Research Committee, five of the six criteria in table 2 should be present.42 The North American recommendations for the diagnosis are similar, except that fever is a mandatory criterion, and four of the remaining five criteria are required to establish the diagnosis.6 However, in addition to patients fulfilling the criteria for complete KD, many patients have some but not all of the clinical features of KD. These patients may still be, or are, at risk of CAA. Diagnosis of these ‘Incomplete KD’ cases depends on a high level of suspicion in children presenting with some of the KD features and evidence of systemic inflammation (such as elevated C-reactive protein (CRP), erythrocyte sedimentation rate (ESR), or leucocytosis). Early echocardiography may reveal evidence of coronary vasculitis, confirming the diagnosis of KD in this patient group. A negative echocardiogram does not exclude the diagnosis of KD. In addition to the diagnostic challenge of incomplete cases, the requirement within the existing diagnostic criterion for a fever of greater than 5 days may also lead to delayed treatment. While duration of fever has historically been of importance for the standardisation of case definitions, clinicians should not delay in making a diagnosis of KD and instituting treatment (see below) if: (1) 5/6 diagnostic criteria of KD are present before day 5 of fever; (2) CAA or coronary dilatation are present, or (3) evidence of persistent elevation of inflammatory markers with no other explanation in patients where there remains clinical suspicion of KD.2 ,6 ,9 We recommend seeking early expert advice in such cases. Irritability is an important sign which is nearly always present, although interestingly not included as one of the diagnostic criteria.9 ,43 The exact mechanism of the irritability is unclear, but it may be related to the presence of aseptic meningitis.9 ,43 Another important clinical sign is the development of erythema and induration at the site of previous Bacillus Calmette–Guérin (BCG) immunisation.9 ,44 The mechanism of this clinical sign is believed to be due to cross-reactivity of T cells in KD patients between specific epitopes of mycobacterial and human heat-shock proteins.9 ,44 The diagnostic criteria may present sequentially, such that a so-called ‘incomplete’ case can evolve with time into a ‘complete’ case.6 Thus, the diagnosis of KD must be considered in any child with a febrile exanthematous illness and evidence of inflammation, particularly if it persists longer than 4–5 days. Meta-analysis comparing anti-inflammatory doses of aspirin (30–50 mg/kg/day) with high-dose aspirin (80–120 mg/kg/day) combined with IVIG found no significant difference in the incidence of CAA between the groups.55 Currently, aspirin at a dose of 30–50 mg/kg/day is recommended during the acute phase of the illness, as this may be better tolerated than higher doses in terms of gastrointestinal and other side effects. The dose should be reduced to an antiplatelet dose of 3–5 mg/Kg once fever and inflammation have subsided. Corticosteroids are effective treatment for other forms of vasculitis, but early retrospective analyses suggested that corticosteroids were associated with increased risk of CAA.56 However, this almost certainly reflected selection bias as the sickest patients received steroids. Clinical trials evaluating the use of corticosteroids plus IVIG have produced seemingly confusing results.10 ,11 ,14 ,57–59 Chen et al60 recently reported a meta-analysis comparing the frequency of CAA in patients treated with IVIG plus corticosteroids or IVIG alone for the primary treatment of KD. They followed standard guidelines for conduct of meta-analyses, and used defined criteria for trial quality assessment, including evaluation of criteria for diagnosis; study design; follow up and blinding.60 They identified nine clinical studies meeting their quality criteria, involving 1011 patients. Six out of nine were prospective RCTs; two were non-randomised controlled studies; and one was a retrospective report.60 Of the 1011 patients included, 536 received IVIG+corticosteroids and 475 IVIG alone.60 They found that significantly fewer patients receiving IVIG+corticosteroids developed CAA than those receiving IVIG alone (7.6% vs 18.9%; OR: 0.3; 95% CI 0.20 to 0.46).60 The benefit was found in several subgroup analyses including the six prospective RCTs, and studies using prednisolone or intravenous methylprednisolone.60 They found no significant differences in frequency of severe adverse events between the steroid and non-steroid treatment groups.60 Chen's meta-analysis provides convincing evidence that steroids combined with IVIG as initial treatment reduces overall risk of CAA in severe KD.60 However, neither the meta analysis nor the RAISE study provides clear answers as to whether all children in the UK should be treated with corticosteroids, and what dose, duration and route of corticosteroids should be used. Heterogeneity in corticosteroid dosing in the published trials is an important consideration when translating the results of Chen's meta-analysis into clinical practice, as different corticosteroid regimens were used in each of the trials. This is illustrated when two of the methodologically strongest studies, the American Paediatric Heart Network study10 and the recently reported Japanese RAISE study14 are considered in more detail. The American study evaluated the use of intravenous methylprednisolone (30 mg/kg) given as a single dose in unselected patients with KD.10 By contrast, RAISE evaluated lower-dose (2 mg/kg) intravenous prednisolone given for 5 days; if fever settled, this was then converted to oral prednisolone which was subsequently tapered over 15 days only after the CRP normalised.14 Moreover, patients were included in RAISE only if they were at high risk of IVIG resistance based on the Kobayashi score.14 Perhaps unsurprisingly then, these two studies have produced conflicting results, with steroids conferring significant benefit in the Japanese RAISE study, but a lack of overall benefit in the American study. Second, as seven of the nine studies in the meta-analysis were undertaken in Japan and only two in the USA, the results may not be applicable outside of Japan. There is some concern that KD in Japan may behave differently from the disease in non-Japanese populations, highlighted by the failure of the Kobayashi and other scores used to predict IVIG non-response in Japan to accurately predict non-response to IVIG in the USA.14 ,47 ,51 The meta-analysis may say more about the beneficial effect of steroids in Japanese patients meeting the criteria for predicted IVIG resistance than about an overall benefit in unselected patients. Third, while the meta-analysis has not revealed any increase in severe adverse events associated with corticosteroid use, the total number of patients receiving steroids was only about 500.60 Most paediatricians who routinely use corticosteroids for the treatment of other systemic inflammatory diseases will probably be comfortable with a modest dosing regimen of prednisolone weaning over 3 or 4 weeks, if this truly will spare some children from potentially lifelong cardiac sequelae, although vigilance during follow-up for the presence of corticosteroid-related complications, such as hypertension, behavioural changes, secondary infection, hyperglycaemia and bone necrosis is required. As 80% of patients with KD respond to aspirin and IVIG, and CAA are most commonly seen in those who fail to respond to IVIG, we urgently need a means of predicting IVIG resistance so that corticosteroids can be included in primary treatment of selected patients at risk of IVIG non-response. However, the Kobayashi score, used by Japanese investigators had low sensitivity (but good specificity, table 3) for the prediction of IVIG non-response in studies in the USA.14 ,51 Therefore, a low Kobayashi score does not reliably exclude IVIG resistance. With these caveats in mind, we propose a pragmatic treatment approach (below) based on the current data, while advocating further research to provide the evidence base, which is currently lacking. Patients who have already declared themselves as IVIG-resistant, that is, with ongoing fever, and/or persistent inflammation or clinical signs ≥48 h after receiving IVIG as a single dose of 2 g/kg. Patients with features of the most severe disease (and therefore the greatest likelihood of developing CAA). In the absence of validated risk scores outside of Japan, we suggest that such patients include the very young (<1-year-old); those with markers of severe inflammation, including: persistently elevated CRP despite IVIG, liver dysfunction, hypoalbuminaemia, and anaemia; and the small group who develop features of haemophagocytic lymphohistiocytosis (HLH)61 and/or shock. What corticosteroid regimen to use? Chen's meta-analysis does not provide us with an evidence base for optimal corticosteroid dose/duration.60 From the studies included, an intravenous preparation equivalent to 2 mg/kg prednisolone for 5–7 days, or until CRP normalises, followed by oral prednisolone weaning over 2–3 weeks seems logical. However, in the absence of a robust evidence base, flexibility of the steroid regimen ultimately used for individual patients is recommended, and should ultimately be determined by treating clinicians: the updated guideline provides two suggested regimens (figure 1). Recommended clinical guideline for the management of Kawasaki disease in the UK. Since risk scores for IVIG resistance perform sub-optimally in non-Japanese patients (Table 3), we cannot recommend their use to define high risk definitively; clinicians may, however, choose to consider the clinical and laboratory parameters listed to identify “high risk” patients. If the Kobayashi risk score is “positive” in a non-Japanese patient (eg,≥ 5) then IVIG resistance is likely; however a score <5 does not reliably exclude IVIG resistance. The aim of treatment is to switch off the inflammatory process that is damaging the coronary arteries as rapidly as possible. In the absence of a strong evidence base favouring a specific corticosteroid regimen, two suggested corticosteroid regimens for high-risk cases are provided for clinicians to choose from. For those on low dose aspirin, we also recommend avoiding the concomitant use of non-steroidal anti-inflammatory drugs (NSAIDs) as these interfere with the anti-platelet effect of low dose aspirin. *Treatment can be commenced before 5 days of fever if sepsis excluded; treatment should also be given if the presentation is > 10 days from fever onset if there are signs of persistent inflammation; **Kobayashi risk score ≥5 points aRefer to paediatric cardiologist; ¶ Other specific interventions such as positron emission tomography (PET) scanning, addition of calcium channel blocker therapy, and coronary angioplasty at discretion of paediatric cardiologist. + Other immunomodulators may include ciclosporin. ♥For infants, Z score for internal coronary artery diameter >7 based on Montreal normative data: http://parameterz.blogspot.co.uk/2010/11/montreal-coronary-artery-z-scores.html. Should a second dose of IVIG be given to patients who fail to respond to the initial dose? In patients who have shown some but not complete response, we suggest that a second dose of IVIG is given at the same time as commencing steroids if they have not already been commenced for signs of severe disease (see above). A second dose may not be beneficial if there was little response to the first dose. Vigilance during follow-up for the presence of corticosteroid-related complications, such as hypertension, secondary infection, hyperglycaemia and bone necrosis is required. Etanercept (soluble TNF-α receptor) is an alternative TNF antagonist, and has been reported to be safe and well tolerated in 15 children with KD when given at a dose of 0.8 mg per kilogram weekly for three doses, and may be beneficial.70 A recent multicentre study in the USA comparing IVIG and aspirin to IVIG/aspirin plus infliximab as initial therapy in an unselected group of KD patients has been completed and showed no significant reduction in CAA, although the trial was underpowered for this endpoint. There was, however, faster resolution of the acute-phase response in the infliximab group. (Burns JC et al, personal communication and manuscript submitted). Thus, anti-TNFα should be considered in patients with IVIG-resistant KD, and further study is required of its role as first-line therapy. Other immunosuppressive agents such as ciclosporin, cyclophosphamide, methotrexate, and plasma exchange, have occasionally been used to treat patients who do not respond to IVIG, steroids and anti-TNFα.2 ,6 Genome-wide association studies have identified polymorphisms of ITPKC, a negative regulator of T-cell activation, and other T cell signalling pathway genes associated with KD susceptibility, IVIG resistance, and increased risk of CAA in Asian and US children.36 ,40 This suggests that calcineurin inhibitors (such as ciclosporin) may be applicable for the treatment of KD.71 ,72 These initial reports need to be tempered by the knowledge that calcineurin inhibitors can also be toxic to the endothelium; for example, in Behçet's disease it is recommended that these are avoided in those with cerebral vasculitis since there is a concern that this class of drug may exacerbate vasculitic complications in some scenarios.6 ,73 The use of these agents cannot be recommended routinely but can be considered on a case-by-case basis after consultation with specialist units. The recommendation regarding timing of immunisations after KD remains unchanged from our 2002 guideline.9 Immunisation with all vaccines should be deferred for at least 3 months following an episode of KD treated with IVIG, mainly due to the potential lack of effectiveness of live vaccines following IVIG75 and due to the potential for any vaccine to induce potentially detrimental immune activation during the convalescent phase of KD. The evidence for this latter recommendation is anecdotal. Thereafter, all vaccines should be administered as recommended by national schedules. Patients who require long-term aspirin for persistent CAA should be considered for immunisation with varicella zoster virus (VZV) vaccine in view of the association of VZV and aspirin with Reye's syndrome. A detailed review of this area is beyond the scope of this article. A statement of the American Heart Association committee on rheumatic fever, endocarditis and KD published in 2004 provided detailed guidance on the stratification of KD patients according to their relative risk of myocardial ischaemia.6 Risk-level categories are summarised in table 4. This stratification allows for patient management to be individualised with respect to medical therapy to reduce the risk of thrombosis, physical activity, frequency of clinical follow-up and diagnostic testing, and indications for cardiac catheterisation and coronary, CT and MR angiography.6 Stress echocardiography when considered safe by cardiologists, should be performed on all patients with persistent structural abnormalities of the coronary arteries.6 If there is evidence of inducible ischaemia, then invasive angiography is indicated.6 For these patients, bi-annual follow-up and aggressive management of traditional cardiovascular risk factors is also recommended for all patients.6 CT coronary artery calcium scores are linked to mortality in atherosclerosis; it has been suggested that this imaging modality could have an important role in the late follow-up of KD.87 Adolescents and young adults may develop coronary calcification that is detectable only more than 10 years after the acute KD episode; while promising as a potential means of stratifying patients for a long-term follow-up, it is not yet known in KD exactly how coronary artery scores relate to late morbidity or mortality. At the time of this writing, a long-term follow-up study of premature atherosclerosis/late KD vasculopathy is ongoing in the UK; it is anticipated that this study will help guide clinicians regarding long-term follow-up after KD. Since the recognition that IVIG could reduce the morbidity and mortality of KD, treatment of this condition has been largely protocol driven. Although authorities differ in their advocacy for a variety of treatment protocols, it is likely that the success of therapeutic intervention in KD is due to modulation of the causes and/or propagators of inflammation. As such we have re-evaluated the current prescriptive approach to the management of KD in the light of the published literature, adding corticosteroids into primary therapy for severe and IVIG unresponsive cases; and suggesting a role for anti-TNF- α if systemic inflammation persists despite IVIG, aspirin and corticosteroids. Repeated protocol-driven administration of IVIG in patients with little evidence of clinical and/or laboratory improvement may be detrimental, and treatment with corticosteroids and/or anti-TNFα considered. Unchecked inflammation damages the vasculature in KD; the acute-phase response, particularly CRP, combined with clinical response can be used to assess the efficacy of any intervention. A minimum of three echocardiograms should be performed in the first 6 weeks of the illness. The justification for this is: (1) some patients (albeit a minority) can develop CAA in the first week of the illness,6 and early detection of these should prompt more aggressive primary management; (2) early echocardiography (in the first week) may detect extracoronary manifestations, such as mitral regurgitation or pericardial effusion, that may be associated with increased risk of CAA62 (3) early detection of CAA progression and/or development of thrombus might be detected that could result in intensification of anti-inflammatory and/or additional anticoagulation therapy. With this philosophy in mind, and in light of the therapeutic advances discussed above, we present an updated clinical guideline9 for the management of KD in the UK (figure 1). The therapeutic uncertainties raised by the recent studies and are highlighted above, can only be answered by further randomised trials and immunopathological studies to address the issues of patient selection, dose, route and safety of corticosteroid and/or other anti-inflammatory agents. The ongoing BPSU study will provide important data regarding current epidemiology, CAA rates, and mortality of KD in the UK. Studies are also needed to identify biomarkers and clinical scores that work outside of Japan to identify patients at highest risk of CAA and, hence, the need for the addition of corticosteroids and/or anti-TNF in the primary treatment. Concerted international efforts aiming at improving our understanding of the potential infectious trigger, and genetic contribution to KD disease susceptibility or complications are of utmost importance Whether or not KD predisposes to premature atherosclerosis, or more correctly, late-KD vasculopathy, is the subject of an ongoing UK study, and will help provide an evidence base to inform long-term management strategies in the UK. Last, a significant challenge that remains is to coordinate transitional care of KD patients into adulthood. In the UK, this is currently done suboptimally, and the development of local networks to transition cardiac care from paediatrics through adolescence and into adulthood are urgently required. In conclusion, in addition to the worldwide effort to understand the genetics of KD, it is time for a concerted drive to improve the evidence base for acute and lifelong management of this important childhood disease in the UK. As KD is a rare disorder, research to improve understanding of the aetiology, pathogenesis, treatment and outcome requires multicentre collaboration as in, for example, a recent and ongoing National Institute for Health Research (NIHR) multicentre study of KD in the UK.
. Rising incidence of Kawasaki disease in England: analysis of hospital admission data. BMJ 2002;324:1424–5.
. Medium-size-vessel vasculitis. Pediatr Nephrol 2010;25:1641–52.
. Incidence of Henoch-Schonlein purpura, Kawasaki disease, and rare vasculitides in children of different ethnic origins. Lancet 2002;360:1197–202.
. Pathogenesis of Kawasaki disease. Clin Exp Immun 2011;164:20–2.
. Kawasaki disease: update on pathogenesis. Curr Opin Rheum 2010;22:551–60.
. Diagnosis, treatment, and long-term management of Kawasaki disease. Circulation 2004;110:2747–71.
. Sequelae of Kawasaki disease in adolescents and young adults. J Am Coll Cardiol 1996;2:253–7.
. Kawasaki syndrome and risk factors for coronary artery abnormalities: United States, 1994–2003. Pediatr Infect Dis 2006;25:245–9.
. Kawasaki disease: an evidence based approach to diagnosis, treatment, and proposals for future research. Arch Dis Child 2002;86:286–90.
. Randomized trial of pulsed corticosteroid therapy for primary treatment of Kawasaki disease. N Eng J Med 2007;356:663–75.
. A multicenter prospective randomized trial of corticosteroids in primary therapy for Kawasaki disease: clinical course and coronary artery outcome. J Pediatr 2006;149:336–41.
. Infliximab treatment for refractory Kawasaki syndrome. J Pediatr 2005;146:662–7.
. High-dose intravenous gammaglobulin for Kawasaki disease. The Lancet 1984;324:1055–8.
. Efficacy of immunoglobulin plus prednisolone for prevention of coronary artery abnormalities in severe Kawasaki disease (RAISE study): a randomised, open-label, blinded-endpoints trial. Lancet 2012;379:161320.
. Epidemiologic features of Kawasaki disease in Japan: results from the nationwide survey in 2005–2006. J Epidem 2008;18:167–72.
. Evaluation of seasonal patterns of Kawasaki Syndrome-and rotavirus-associated hospitalizations in California and New York, 2000–2005. BMC Pediatrics 2009;9:65.
. Kawasaki syndrome hospitalizations in the United States; 1997 and 2000. Pediatrics 2003;112:495.
. Association of Kawasaki disease with tropospheric wind patterns. Sci Rep 2011;1:1526.
. Association between a novel human coronavirus and Kawasaki disease. J Infect Dis 2005;191:499–502.
. Active or recent parvovirus B19 infection in children with Kawasaki disease. Lancet 1994;343:1260–1.
. Lack of association between infection with a novel human coronavirus (HCoV), HCoV-NH, and Kawasaki disease in Taiwan. J Infect Dis 2006;193:283–6.
. Superantigens, conventional antigens and the etiology of Kawasaki syndrome. Pediatr Infect Dis 2000;19:91.
. Selective expansion of T cells expressing T-cell receptor variable regions V beta 2 and V beta 8 in Kawasaki disease. PNAS 1992;89:4066–70.
. T cell activation profiles in Kawasaki syndrome. Clin Experim Immun 2008;151:267–74.
. Superantigenic activity is responsible for induction of coronary arteritis in mice: an animal model of Kawasaki disease. Intern Immunol 2003;15:79–89.
. Cytoplasmic inclusion bodies are detected by synthetic antibody in ciliated bronchial epithelium during acute Kawasaki disease. J Infect Dis 2005;192:1757–66.
. Racial/Ethnic Differences in the Incidence of Kawasaki Syndrome among Children in Hawaiÿi. Hawaii Medical Journal 2010;69:194.
. Kawasaki disease in families. Pediatrics 1989;84:666–9.
. IL-10 polymorphisms are associated with coronary artery lesions in acute stage of Kawasaki disease. Circ Journ 2010;74:983.
. Cytokine genetic polymorphisms and susceptibility to Kawasaki disease in Taiwanese children. Circ Journ 2010;74:2726.
. Molecular genetics of Kawasaki disease. Pediatr Res 2009;65:46R–54R.
. Genetics of kawasaki disease. Circul J 2012;76:1581.
. A genome-wide association study identifies novel and functionally related susceptibility Loci for Kawasaki disease. PLoS Genetics 2009;5:e1000319.
. A genome-wide association study identifies three new risk loci for Kawasaki disease. Nat Genet 2012;44:517–21.
. Two new susceptibility loci for Kawasaki disease identified through genome-wide association analysis. Nat Genet 2002;44:522–5.
. ITPKC functional polymorphism associated with Kawasaki disease susceptibility and formation of coronary artery aneurysms. Nat Genet 2007;40:35–42.
. Genome-wide association study identifies FCGR2A as a susceptibility locus for Kawasaki disease. Nat Genet 2011;43:1241–6.
. Genome-wide linkage and association mapping identify susceptibility alleles in ABCC4 for Kawasaki disease. J Med Genet 2011;48:467–72.
. A genome-wide association analysis reveals 1p31 and 2p13. 3 as susceptibility loci for Kawasaki disease. Hum Genet 2011;129:487–95.
. ITPKC and CASP3 polymorphisms and risks for IVIG unresponsiveness and coronary artery lesion formation in Kawasaki disease. Pharmacogenomics J 2011;13:529.
. Transforming Growth Factor-+¦ Signaling Pathway in Patients With Kawasaki DiseaseClinical Perspective. Circ Cardiov Gen 2011;4:16–25. 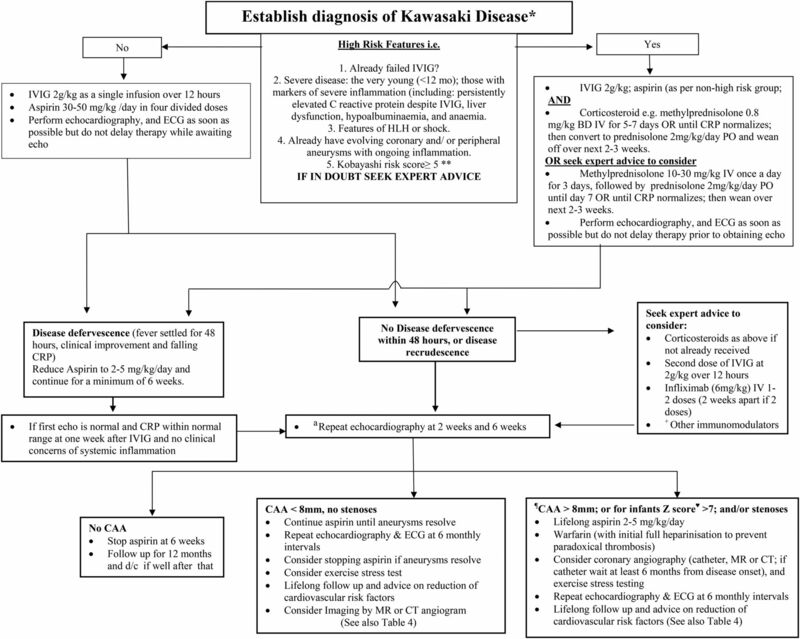 Diagnostic guidelines for Kawasaki disease. 5th edn. Japan Kawasaki Disease Research Committee Tokyo, 2002.
. Neural involvement in Kawasaki disease. Pathol Int 2008;30:365–73.
. BCG reactivation: a useful diagnostic tool even for incomplete Kawasaki disease. Arch Dis Child 2005;90:891.
. Are children with Kawasaki disease and prolonged fever at risk for macrophage activation syndrome? Pediatrics 2003;112:e495–7.
. A case of Kawasaki disease associated with syndrome of inappropriate secretion of antidiuretic hormone. Acta Paediatrica 2004;93:1547–9.
. Prediction of intravenous immunoglobulin unresponsiveness in patients with Kawasaki disease. Circulation 2006;113:2606–12.
. Sterile pyuria in patients with Kawasaki disease originates from both the urethra and the kidney. Ped Neph 2007;22:987–91.
. Prediction of resistance to intravenous immunoglobulin treatment in patients with Kawasaki disease. J Ped 2006;149:237–40.
. Prediction of non-responsiveness to standard high-dose gamma-globulin therapy in patients with acute Kawasaki disease before starting initial treatment. Eur Journ Ped 2007;166:131–7.
. Evaluation of Kawasaki disease risk-scoring systems for intravenous immunoglobulin resistance. J Pediatr 2011;158:831–5.
. Resistance to intravenous immunoglobulin in children with Kawasaki disease. J Pediatr 2008;153:117–21.
. The prevention of coronary artery aneurysm in Kawasaki disease: a meta-analysis on the efficacy of aspirin and immunoglobulin treatment. Pediatrics 1995;96:1057–61.
. A single intravenous infusion of gamma globulin as compared with four infusions in the treatment of acute Kawasaki syndrome. N Engl J Med 1991;324:1633–9.
. Prevalence of coronary artery abnormalities in Kawasaki disease is highly dependent on gamma globulin dose but independent of salicylate dose. J Pediatr 1997;131:888–93.
. Kawasaki disease: effect of treatment on coronary artery involvement. Pediatrics 1979;63:175–9.
. Effects of steroid pulse therapy on immunoglobulin-resistant Kawasaki disease. Arch Dis Child 2008;93:142–6.
. Pulse methylprednisolone with gammaglobulin as an initial treatment for acute Kawasaki disease. Eur Jour Pediatr 2009;168:181–5.
. Corticosteroids in the initial treatment of Kawasaki disease: report of a randomized trial. J Pediatr 2003;142:611–6.
. Intravenous immunoglobulin plus corticosteroid to prevent coronary artery abnormalities in Kawasaki disease: a meta-analysis. Heart 2013;99:76–82.
. Macrophage activation syndrome in the acute phase of Kawasaki disease. J Ped Hem/Onc 2010;32:527–31.
. Extracoronary echocardiographic findings as predictors of coronary artery lesions in the initial phase of Kawasaki disease. Arch Dis Child 2013;98:97–102.
. Matrix metalloproteinase 9 activity leads to elastin breakdown in an animal model of Kawasaki disease. Arthritis Rheum 2008;58:854–63.
. Infliximab as a novel therapy for refractory Kawasaki disease. J Rheumatol 2004;31:808–10.
. Infliximab treatment for refractory Kawasaki disease with coronary artery aneurysm. Circ J 2008;72:850.
. Infliximab for the treatment of intravenous immunoglobulin resistant Kawasaki disease complicated by coronary artery aneurysms: a case report. Pediatr Rheumatol Online J 2009;7:3.
. Serum levels of tumor necrosis factor, interleukin 2 receptor, and interferon-in Kawasaki disease involved coronary-artery lesions. Clin Immunol Immunopathol 1990;56:29–36.
. Infliximab treatment of intravenous immunoglobulin-resistant Kawasaki disease. J Pediatr 2008;153:833–8.
. Infliximab for intravenous immunoglobulin resistance in Kawasaki disease: a retrospective study. J Pediatr 2011;158:644–9.
. Prospective open-label trial of etanercept as adjunctive therapy for Kawasaki disease. J Pediatr 2010;157:960–6.
. Calcineurin Inhibitor Treatment of Intravenous Immunoglobulin−Resistant Kawasaki Disease. J Pediatr 2012;161:506–12.
. Cyclosporin A treatment for Kawasaki disease refractory to initial and additional intravenous immunoglobulin. Pediatr Infect Dis J 2011;30:871–6.
. Cyclosporine for Behcet's uveitis: Is it associated with an increased risk of neurological involvement? Clin & Experim Rheum 2008;26:84.
. Warfarin therapy for giant aneurysm prevents myocardial infarction in Kawasaki disease. Ped Cardiol 2008;29:398–401.
. Use of intravenous immunoglobulin G (IVIG). Best Pract & Res Clin Haem 2006;19:3–25.
. Management of Kawasaki disease in the British Isles. Arch Dis Child 1993;69:631–8.
. Regression of aneurysms in Kawasaki disease: a pathological study. J Pediatr 1982;100:225–31.
. Regression of coronary aneurysms in patients with Kawasaki syndrome. Circulation 1987;75:387–94.
. Long-term consequences of Kawasaki disease: a 10-to 21-year follow-up study of 594 patients. Circulation 1996;94:1379–85.
. Mortality among persons with a history of kawasaki disease in Japan: mortality among males with cardiac sequelae is significantly higher than that of the general population. Circ J 2008;72:134.
. Long-term prognosis of patients with Kawasaki disease complicated by giant coronary aneurysms clinical perspective. Circulation 2011;123:1836–42.
. Prevalence of Kawasaki disease in young adults with suspected myocardial ischemia clinical perspective. Circulation 2012;125:2447–53.
. Kawasaki disease: late cardiovascular sequelae. Curr Opin in Cardiol 2012;27:572–7.
. Catheter interventions for Kawasaki disease: current concepts and future directions. Kor Circul Journ 2011;41:53–7.
. Competition between native flow and graft flow after coronary artery bypass grafting. Impact on indications for coronary artery bypass grafting for localized stenosis with giant aneurysms due to Kawasaki disease. Ped Cardiol 2008;29:266–70.
. Long-term patency of internal thoracic artery grafts for coronary artery stenosis due to Kawasaki disease: comparison of early with recent results in small children. Am Heart Journ 2007;153:995–1000.
. Calcium scoring in patients with a history of Kawasaki disease. JACC: Cardiov Imag 2012;5:264–72. Contributors All authors were involved in drafting the article or revising it critically for important intellectual content, and all authors approved the final version to be published.